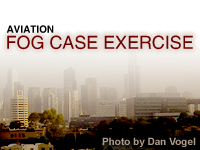 This case exercise focuses on a potential fog event in Melbourne, Australia, on 6-7 April 2008. The key aim of this module is to step through the forecast process during a potential fog event from the perspective of an aviation forecaster with the Australian Bureau of Meteorology. This involves consideration of model guidance and observations, identification of potential areas of fog, forecasting and nowcasting fog formation and clearance, and considering and providing TAF updates throughout. i think is a good case study. I would really like to see the details of the questions such as those wrong question that I have done in this class. This is on the job training for me, I intend to review my studies later. • Identify the possibility and classification of fog from the preconditions using synoptic charts and observations. • Assess fog potential parameters in the short term and forecast the trends in the next 12-24 hours. • Utilise and access relevant fog forecasting tools and assess their usefulness and limitations. • Identify fog using a range of available tools.